Plot – In the midst of the racially tense times of 1970’s America, African American detective Ron Stallworth (Washington) and his white partner Flip Zimmerman (Driver) manage to infiltrate the local chapter of the KKK to investigate their potentially planned violent crimes. Spike Lee fans, be thankful for Donald Trump. I’m sure I’m not alone in my recent doubts surrounding the concern that one time powerful filmmaker Spike Lee was sadly incapable of making another good film. Since the success of Inside Man in 2006 (which was more of a fun film than anything of substance), the outspoken director who wowed us all with memorable and original film’s such as Do the Right Thing, Malcolm X and The 25th Hour had fallen off the deep end with terribly out of form films that included Miracle at St. Anna, Red Hook Summer and Passing Strange, film’s that represented a filmmaker unable to recapture the mojo and incentive needed to produce works worthy of his name. It’s in this era of a Trump reign then that the seemingly faded Lee has found a reason and a tale to breathe life back into his career as a writer and director, with BlacKkKlansman becoming one of Lee’s most accessible and assured works in his longstanding career. There are faults with Lee’s telling of Ron Stallworth’s true life tale, that saw the black policeman infiltrate the Ku Klux Klan with the help of his white partner Flip Zimmerman in Colorado during the racially charged America of the 1970’s, such as some overwrought dialogue, a questionable romantic subplot, strange editing and a collection of overly long sequences but at the end of the day BlacKkKlansman is a highly entertaining outing that harbors a powerful message for our day and age, particularly for citizens of America. As is the case with the best of Lee’s works, BlacKkKlansman features an array of sharply observed dialogue and social commentary mixed with sass and attitude that only Lee could conjure up, that here mixes in brilliantly with the film’s main characters. In the biggest role of his budding career, young Denzel, John David Washington is Lee’s centerpiece as the determined and unflappable Stallworth and he does a top notch job of bringing Stallworth to life as he sets out to do his job in the face of constant adversity and with fine support from the ever constant Driver and notable turns from Topher Grace as KKK head honcho David Duke and Jasper Pääkkönen as violent racist Felix, BlacKkKlansman features one of the year’s strongest overall ensembles. The film doesn’t really inhabit a typical narrative structure as Stallworth and Zimmerman dive further and further into the underbelly of the KKK but Lee’s cast remain constantly engaged with Lee’s mission, that finishes on a confronting end coda that suggests while much has changed, so much hasn’t, making BlacKkKlansman a call to arms for a nation that is still divided. 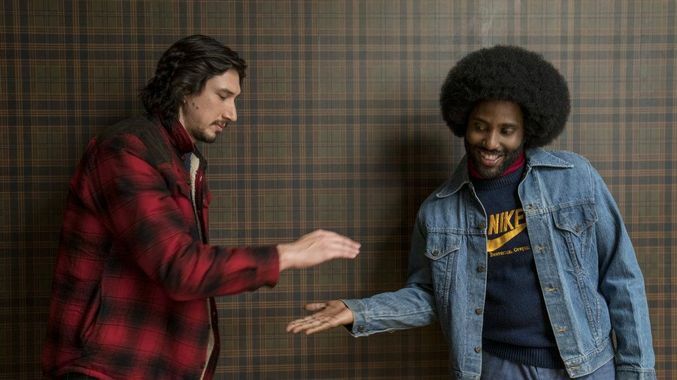 At times laugh out loud funny and at other’s unashamedly confronting, BlacKkKlansman is one of the year’s most memorable features, that while not the very best of Lee’s career, is a welcome return to form for a director that appeared set to end his latter year’s in the cinematic doldrums. When I heard Denzel’s son was in this at first I was like, “ugh nepotism” but it sounds interesting enough and if his name brings attention to a relevant project that mainstream Hollywood wouldn’t touch with a 5 mil budget, I’d give it a pass. It was great to see a film like this do so well at the box-office, I think it will really have a big life on home release! It’s one of those stories that you would thing is to far fetched if it wasn’t true! Great to see it be shown off in such a high-profile film. I think you will have a blast with this one! I loved this film, and so relevant today. The acting was good, but it was the script and direction that really blew me away. Glad you agree mate, it was a very memorable film! I think it will find a massive audience on home release. I have mixed feelings about this film. It’s so powerful, yet I thought it was a little messy from a storytelling standpoint. Despite that, it is easily the most provocative movie I’ve see this year. I know exactly what you mean John. Some editing and narrative choices leaved a lot to be desired but the power of the film and some great acting/script work really carried it to another level.